Favorite Disney Restaurant – Bon Voyage Breakfast at Trattoria Al Forno…Delicious food & best character interactions! 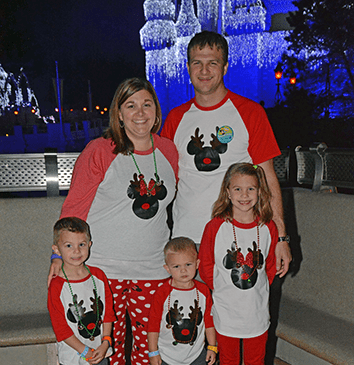 Favorite Time of year to go to Disney – Christmas! Ever since planning our first family vacation to Disney World with my kids I’ve been in love with all things Disney! I absolutely loved every minute of it, and having young children to experience it with through their eyes was truly amazing! Helping people has always been a big part of who I am, and being able to combine my love of helping people and Disney by becoming a travel agent has been like a dream come true. I love building relationships with clients to help better understand them and their wants and needs to make their vacation perfect for them. It doesn’t matter who I’m planning the trip for, or how long it is, I still get that same adrenaline rush every single time I’m booking dining or fast passes for my clients; as if it was my own. The part I look forward to the most is hearing how magical everyone’s trip was after it’s done and seeing pictures full of smiles. That is why I do what I do. Being able to help people plan a trip of their dreams to such a magical place and giving them memories that will last a lifetime is priceless and makes me excited for each and every one of them.